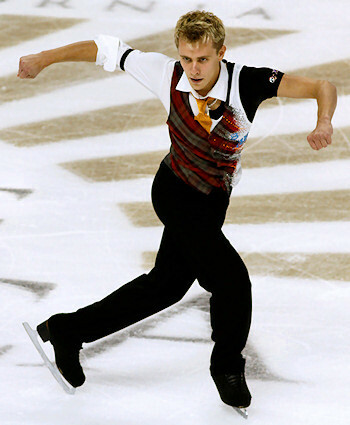 Michal Brezina earned his first Grand Prix medal at 2011 Skate America. In what was an uneven competition, Michal Brezina of the Czech Republic came away with his first Grand Prix title in Ontario, Calif., at Skate America. Meanwhile, veteran competitor Kevin van der Perren moved up from fourth place to take the silver—his best finish on this stage in four seasons. World silver medalist Takahiko Kozuka struggled throughout his program, and finished in third place. Brezina finished third in the free skate after opening with four strong triple jumps in his The Untouchables program. Brezina made three jumping errors at the end of his program, but promises to be stronger for his next competition—Trophée Eric Bompard in Paris next month. Brezina finished with 216.00 points overall, more than three points ahead of van der Perren. It was a surprise to many that van der Perren’s name even appeared on the Grand Prix roster earlier this season as he announced through various sources that he would put a close to his competitive career after last season. However, the 29-year-old proved that he still belongs on the international stage, ending his four-year Grand Prix medal drought. Van der Perren won the free skate with six triple jumps—including a triple Salchow-triple toe loop-triple toe loop combination—and a perfect opening quadruple toe loop. His total score was 212.48 points. Though Kozuka had the second best free skate of the day, the Japanese Champion failed to demonstrate his usual flair and technical mastery in his Fantasia for Nausicaa program. The 22-year-old fell on his opening quad attempt, and struggled with several triple jumps as the program progressed. Kozuka missed the silver medal by .39 points, finishing with 212.09 points overall. Hometown boy Richard Dornbush opened his western-themed program with a quadruple toe loop that inspired the loudest ovation of the afternoon. The U.S. silver medalist did land three clean triple jumps, but struggled with both triple Axel attempts and was not satisfied with his Grand Prix debut. He finished with 202.27 points overall. Kazakhstan’s Denis Ten moved up from sixth place after the short program to finish in fifth overall, while Japan’s Daisuke Murakami faded from third place to finish sixth..
USA’s Douglas Razzano finished in seventh, while Italy’s Samuel Contesti and France’s Florent Amodio were eighth and ninth, respectively. USA’s Armin Mahbanoozadeh rounded out the field in 10th place. Razzano was pleased with his performance.